Did ya hear about the new app and iPhone dongle from Oscar Mayer? It's an alarm clark app that runs on your iPhone. And when the alarm sounds, it sounds like bacon. And, looks like bacon. And ... and here's the best part ... it smells like bacon. If, and that's a big if, you have the dongle. 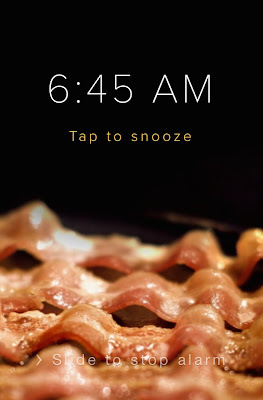 It plugs into your iPhone and, when the alarm sounds, emits the aroma of bacon. So you can wake to the sight, sound, and smell of bacon. Here's the problem: you can't buy one. You have to register to win one at an Oscar Mayer Website. I entered. Didn't win. Entered again. Still didn't win. Maybe they've given them all away. Or maybe I'm just not lucky enough to win one. But, if you have one, I'd love to hear about it. Does it really work? I assume it does, but since I don't know anyone who has one, I've not heard first-hand about it. I think I'll just go eat some bacon. Which is really what they wanted all along. But that's okay. It's what I want too. I could be mistaken, but I believe a solution to this was included in the "Great Sammich Compromise of ’83" that Frank mentioned. The clause reads: "Wife, cook me BACON!" Of course, you have to have a wife to win that battle. So not only do I get woke up from a sound sleep but the thing that brings me out of that sleep is just a lie? There has to be a political metaphor in there somewhere but now I am hungry for bacon and cant think. Don't get the cake app either. I heard the cake is a lie, too. I got the wife version as well. Mine's edible. Okay...so maybe I'm a sucker of Obama voter proportions, but has anybody actually succeeded in even registering for a chance to win? I've gone to the site on three different computers and used three different browsers and none, repeat NONE of them have allowed me to actually enter any data. Just a scam to drive web traffic or...? If they were smart they would give them away!! Then it would be a clever 'marketing' stunt!